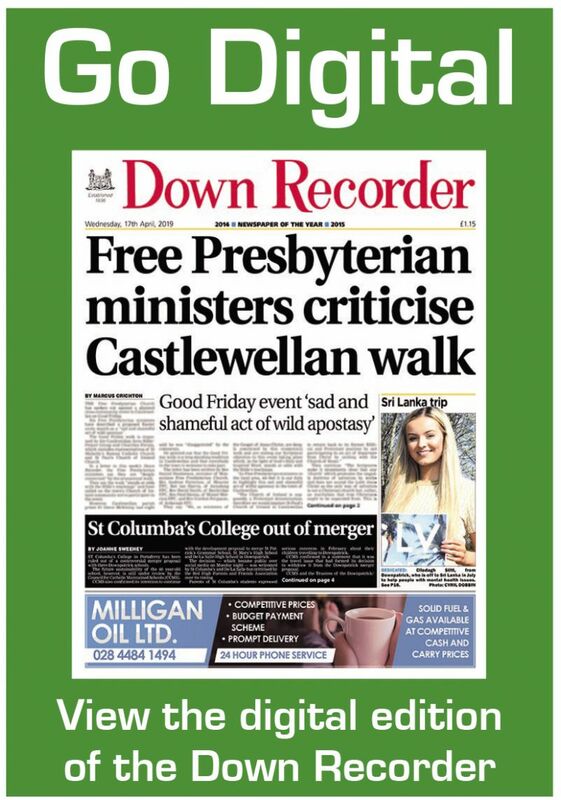 KILLYLEAGH — A Killyleagh priest has spoken of his sadness at an attempt to burn down his parochial hall. Fr Peter O’Hagan said he was surprised and baffled by the fire, which gutted the porch of St Mary’s Hall in Irish Street shortly after midnight on Tuesday. “This kind of incident certainly does not fit in with anything I have known here,” he said. “It saddens me greatly that such a thing can happen. It was Fr O’Hagan who discovered the fire. He lives almost beside the hall and saw the blaze from an upstairs window. He telephoned the police and fire brigade and two appliances from Downpatrick were called to the scene. They managed to confine the fire to the porch, though this was completely gutted, and there was some smoke damage to the inside of the hall. A number of chairs stored in the porch were also destroyed. However, damage to the hall, which was formerly used as a church, could have been much worse and the fire could even have spread to the parochial house, which is nearby. The police said that they were treating the fire as malicious. It is know that a small window at the side of the porch had been broken before the blaze and the doors of the porch were found to be open, even though they had been heavily bolted from the inside. MOURNES — Five children were taken to hospital after a minibus crashed down a 19ft and into a stone wall near Spelga Dam yesterday. Two of the children received fractured skulls and are believed to be seriously injured, while a third had his leg broken. The other two were released after treatment for minor injuries. The accident happened on the Slievenaman Road between Spelga Dam and Newcastle. The driver of the minibus swerved when a flock of sheep ran out on to the road. The minibus was carrying one of two loads of children from an Army base in Portadown. BALLYHORNAN — Floyd Patterson, the former world heavyweight boxing champion, ‘ducked’ away from his ringside seat at a special banquet in Banbridge to make a quick visit to the Lecale coast this week. The purpose of his trip was to meet Mr Owen Kerr, the man who was largely responsible for bringing him over to Ulster for a whistle-stop seven-day tour. Mr Kerr, who comes from Strangford but is staying at his holiday home in Ballyhornan, joined forces with the successful Ulster boxing coach, Gerry Storey, and the Sports Council to bring Floyd over to Northern Ireland to launch the Sport for All Week. Unfortunately Mr Kerr’s hopes of having six of Floyd’s up and coming boxers to stage exhibition fights in either Ballynahinch or Newcastle fell flat due to previous bookings at local hotels, and they had to be rearranged in Warrenpoint. Floyd chatted with Mr Kerr and his wife and children and friends for more than an hour, recalling his golden days in the 1950s when he won the Olympic title and then the world title four years later. Floyd, who has his wife and two young children over with him, told Mr Kerr how he liked Ulster and spoke highly of Donegal and, of course, the Lecale coast. SAINTFIELD — A Saintfield girl left yesterday to represent the South Eastern Education and Library Board at an international youth camp in Greece. Ellen Welsh, a member of Saintfield Assumption Youth Club, was selected to represent the area and flew out yesterday for a fortnight’s stay. Ellen, who lives in Downpatick Street, had her name put forward by the youth club and she was elected along with four others from the province to represent Northern Ireland. The club, under the leadership of Harry Murray, from Ballygowan, sett about raising money to send Ellen out and a series of projects, including bazaars, dances and ballots, raised sufficient money to give Ellen the chance of a lifetime. NEWCASTLE — Beauty and talent went on parade at the Slieve Donard Hotel when the gala finals of the Sweet Heart of Down and talent competitions were held. The new Sweet Heart of Down is Miss Karen Griffiths, a 20 year-old brunette who works as a personnel assistant with the BBC in Belfast. Karen, whose vital statistics are 35-24-35, took the winning trophy plus a cheque for £150. In second place, with prize money of £50, was Donna Anderson, while Heather Cousins came third and received £25. In the talent contest young Adrian Hardy took the laurels with his rendition of ‘If,’ which he accompanied on the guitar. Adrian (20) received a trophy and a cheque for £150. In second place was 28 year-old singer Veronica McManus, who received a cheque for £50, and third place went to a singing group, Triad, made up of Josephine Mulvenna, Elizabeth Carville and Eilish Mulvenna, who received a cheque for £25. ANNACLOY — A former Annacloy man has been appointed principal of Coleraine Technical College. Mr Desmond Clements, who is 45 and is married with two sons, has been head of the engineering department at Londonderry College of Technology for the past 16 years. He has served on many Department of Education Committees on further education and was chairman of the Northern Ireland division of the Association of Teachers in Technical Institutions in 1975. DOWNPATRICK — Tote betting is likely to return to Downpatrick racecourse for the first time in eight years. The Tote should be in operation for the September 30 meeting and is the latest move in the battle to keep the course alive when government cash dries up at the end of this year. The man behind the move is politician and trade unionist Paddy Devlin, who has pledged his support in keeping racing at Downpatrick. He and Downpatrick Race Club chairman Major William Brownlow were in Dublin last week at a top-level meeting with Irish Racing Board officials. BALLYGOWAN — Young football fanatics in Ballygowan could soon have a pitch of their own if latest plans get the go-ahead. At a meeting of Ards Borough Council this week, Mr Jim Ritchie, the council’s recreation officer, said that it may be possible to erect goalposts on a strip of land on the Belfast Road, Ballygowan. The move to provide a kick-about area for youngsters came in response to an urgent plea from Ballygowan councillor Tom Gourley. Mr Gourley told a recent council meeting that young children in the area were often put off the Dickson Park pitch in Ballygowan by older people and outside teams. COMBER — The ‘Blackmen’ walked in Comber on Saturday for the first time in 13 years — and the sun and large crowds came out in force to greet them. A record number of over 8,000 members of the Royal Black Institution from all over Down took part in the demonstration. They came from some 118 preceptories and were led by an equally high number of bands along the route to the field. In a bid to avoid traffic congestion in Comber local police closed off the roads from 9am to 6pm and motorists were advised to take alternative routes.